Headphones are a great way to isolate yourself from the world and enjoy peaceful and alone time with your music turned on and a cup of coffee. However the problem is, if you live in a loud city and there is a lot of noise around you, the only way to hear your music; and cut down the noise is turning up the volume of your headphones. Your doctor may not be happy with this and can hurt your ears long term. This guide is about the Top 3 Best Noise Cancelling Headphones under $100 that are currently available in the market right now. Note: Check out our guide about Different Types of Headphones Explained, to get to know more about noise cancelling headphones. Before introducing the top 3 Best Noise Cancelling Headphones under $100, I want you to understand that the kind of Active Noise Cancelling quality you’re get in a $100 headphones isn’t same to the one you get in a headphone over $300. There are certain compromises to make in terms of sound quality and experience, nonetheless you’ll save yourself from damaging your ears over a longer period of time. 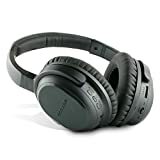 A top ranked product when it comes to Active Noise Cancelling Headphones under $100, C﻿﻿owi﻿﻿n E-7 is a popular choice as it has 700+ Customer Reviews and a good 4/5 star ratings. The package it comes with is very simple and trust me don’t expect much from packaging from headphones under $100 that offer so much features packed into one headphone. Inside the package, you get a 2-page user manual, a micro-USB charging cable, a 3.5 Aux cable, carrying pouch and the headphone itself. Since it’s a Bluetooth wireless headphone, you don’t need to worry about using the provided Aux cable, however you can use it to save battery life and while listening music at home. At first look the headphone looks cheap due to its flashy and glossy plastic finish at the back of earcups and tacky feeling. Moreover they also look big and can be intimidating if worn by people with small heads. 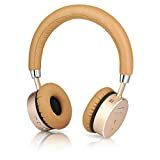 Fairly under $100, the headphone has a good noise cancelling ability that will allow you to listen to music at lower volumes without damaging your ears. Another thing to notice is that, since it comes with Bluetooth connectivity as well, you can a fairly decent wireless noise cancelling headphone that will last through the weekend due to its 30 hours battery life. To add to its wireless connectivity, you can NFC connection as well on the left side of the headphone that also features play/pause button and volume rockers. The earcups are round in shape and swivel 90 degress, laying flat on the ground. Included is a microphone on the earcup too that allows it to be used while calling. Golzer is not a renowned brand when it comes to Headphones, let alone Noise Cancelling Headphones. I’ve already featured them in my list about Best Headphones for a great movie Experience, and the people who bought it, totally loved it! The design is similar to the other Noise Cancelling Headphones we’ve seen in this price bracket and nothing sort of extra ordinary to be talked about. ...along with that you get a big Headphone Carrying Case, USB Cable, 3.5mm male to male headphone cable, 6.3mm adapter and an airline adapter. 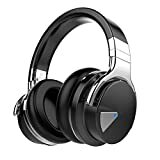 The best part is, these Best Noise Cancelling Headphones under $100 are wireless Bluetooth 4.1 headset with mic built into the headset, along with AptX technology that offers skip free music. The company claims that this headset offers upto 85% Noise Cancelling; which happens to be perfect during Air Travel and Long Transit under noisy environment. You even have plenty of modes to use this headset... You can use this with Noise Cancelling mode only that offers 30 hours of battery life without using Bluetooth. With Noise Cancelling turned off and only in Bluetooth mode, the headset offers 15hrs of battery life. And 12 hours of Battery life if used Bluetooth + Noise Cancelling feature used together. Monoprice is a bigger player in the industry when it comes to producing cheap but great sound quality audio products. We’ve already featured it’s headphones in our list of Best Headphones for Rock music and another of its speakers in our list of Best Audiophile speakers. The brand is a favorite among many consumers and tech reviewers too. Just like the previously mentioned Golzer BANC-50, Monoprice 10010 design too is stripped down and nothing much to talk about. These have glossy back and only single power button... unlike the Golzer BANC-50 that features plenty of easy to access buttons along the line. The sound quality is however better on these one... for similar price. They also offer 92% Noise Cancellation... along with 50 hours of battery life. Monoprice 10010 aren’t wireless headphones, you’d need to connect these to your smartphone via the provided detachable cable that also comes with an inline microphone. Built quality on this isn’t something to complain about, as they’re study and can definitely take a fall or two... even the earcups are comfortable with memory foam like padding on these. I’d still like to bring to your notice, for the price; they sound and work just right. Inside the package you get a pretty large Hard Shell Carrying Pouch, along with two 3.5mm jack detachable cables (one with microphone), Airline adapter and 6.3mm adapter. Who said that the Best Noise Cancelling Headphones under $100 shouldn't be stylish looking. If it is so, then BOHM B-66 is sort of an exception. The brand has certain good quality audio products under its name and with 4.4 star ratings on Amazon; coming from 500+ customers, you can be rest assured that you’re looking at a capable and premium looking Noise Cancelling Headset at not so premium price. 18-Hour rechargeable battery: charge your wireless headphones for 3 Hours & enjoy up to 16 hours of playtime (18 Hours talk time), answer incoming calls right on your stereo headphones & your music will automatically resume when you hang up. In order keep the headphine in connection mode press the MFB BUtton (Large button on left earphone) and keep holding it down. After a couple seconds an ascending tone denotes that the Headphones are turned on. When there is double beep denoting the Headphones are in pairing mode. when the headphones have the Noise Cancellation feature active but no Audio streaming through the headphones, there will be some static noise which is the Noise Cancelling waves working. The higher volume the Headphones and Device each are set at can increase the volume of this Noise Canceling white noise. These are on-ear headphones that come with Bluetooth 4.0 technology. Design wise, as you can see from the images is much superior than the previously mentioned other two Best Noise Cancelling Headphones under $100. The looks are that of any premium looking headphone that costs well over $300. and certainly is meant to draw attention. ...with the Brown and Gold version looking much superior than the other one. Earcups are housed in aluminum, whereas the earpads and headbands have faux leather padding which helps in attaining that premium looks. Just like the headphone, its package is also premium. You get a round hard shell rigid carrying case that stores the headphones along with a detachable cord, airline adapter and a USB cable. These do not require batteries, allowing you to charge them via the provided USB cable. At full charge they last for 16 hours, which is more than enough. "Bohm B-66 is a great looking Active Noise Cancelling Headphone that definitely cancels out outside ambient noise allowing you to enjoy your music with ease; while also acting as a style statement when not in use. Sound quality is excellent on the Bohm B-66 with clear mids, great bass and balanced highs... It doesn’t get any better than this when it comes to budget Noise Cancelling Headphone." Apart from the name, I particularly like the design of CB3 Hush. Just like the name, it has a very simple yet non-obtrusive design that flows along the body very well. Available in 2 different colors: Silver and Black, the CB3 Hush is an active noise cancelling headphone that gets the job done just under $100. Along with Active Noise Cancelling, you also get Bluetooth 4.0 support; allowing you the freedom that you require. WIRELESS W/ MICROPHONE- No wires needed, experience the freedom and advantages of wireless headphones. Wireless not your thing? We have you covered with with an included aux-cable. Microphone is included. CB3 Hush comes in a box that includes the headphone itself, along with a full-sized carrying zipper case, airline adapter, 3.5mm AUX cable, USB charging cable and an additional zipper pouch to keep the wires and other accessories. For an ANC Bluetooth headphone; costing under $100, you pretty much get a complete package from CB3 Audio. Technical specifications wise, the CB3 Hush has 40mm drivers inside each cup that has capability of producing frequency range between 20Hz-20kHz, along with an impedance of 32 Ohms. Coming to battery life, it features a 550mAh battery that can gets full charged within 2.5 hours (charging time can be faster if done via a wall charger) and offers a standby time of 980 hours. Though there’s no official word on battery life when in use, however my test confirmed it lasts around 10 hours with ANC and Bluetooth turned on. CB3 Hush does a pretty good job considering its price of fairly under $100. It eliminates most of the noise while you’re sitting inside a train or walking through a subway or even a plane’s engine without affecting sound quality. Even the sound quality is warm and responsive to all kind of music genres you’re listening and no connection drop or noticeable audio delay. However I would have loved, if they could be paired with two devices at once, incase I want to switch between my mobile and laptop. Don’t get me wrong, but Monster Inspiration are my personal favorite ANC headphones and now that they’ve got under $100, hope they’ll be yours favorite too pretty soon. Available in Black, White, Silver and Grey: this noise cancelling headphone from Monster started out with bang, as they retailed for close $300 when launched. However now things have got sweeter and now you can get this age-defying styled headphones at just under $100. Launched back in 2012, you still get the premium unboxing experience you would have got earlier when the Monster Inspiration used to retail at $300. Inside the box, you get a very durable D-shaped zippered carrying pouch, inside the pouch you have the headphone itself, along with a set of three flat-cable with two containing inline microphone. Moreover there’s also a headband strap included as well. As you see from the images, this headphone looks premium from head to the toe and why not, as it comes from a premium brand altogether. Talking about it design, the headphone has very straight lines and easy curves along the edges. Even the earcups are rectangle in shape with rounded edges. However the earcups can fold inside, reducing its overall footprint and making it portable. The overall built is done using metal, however the earcups and headband are covered with leather, giving it a premium feel to the T.
Its soft earcup padding is easy on the ears and comfortable for long use, moreover it can passively block noise once you’ve worn them. Coming to its sound quality, the Monster Inspiration has a very tight and deep bass, which is a major reason why they’re massively popular among consumers. These are meant to listen to Rap, Hip Hop, Jazz, Pop and genres where deep bass happens to be a major driver. However that doesn’t means genres like Rock and Acoustic are left out, but the sound might sound slight different due to added bass. "To be honest, I can’t get enough of the Monster Inspiration, they are an awesome which are available at a very cheap price right now (trust me! ), go get ‘em before they’re no more available." With modern technology available to us at cheap price... it isn’t hard finding a good quality and Best Noise Cancelling Headphones under $100. The top 3 headphones I listed are some of the best you can find right now in the market. If you live in a noisy environment or just want to cancel out the external ambient noise while listening to music. Purchasing an active noise cancelling headphone is the perfect investment you can do for good health of your ears and great peace of mind.